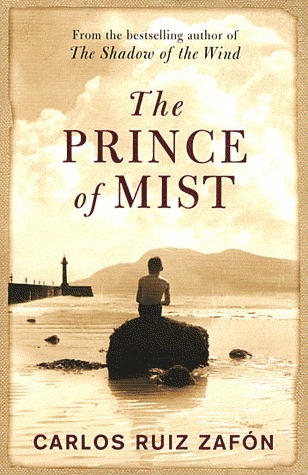 A big change of pace from my nonfiction reading about World War II, The Prince of Mist is a middle grade novel by acclaimed Spanish writer Carlos Ruiz Zafon. I'd read Zafon's The Name of the Wind, a brilliant adult novel blending Gothic horror and magic realism, but I wasn't aware that Zafon actually began his career writing middle grade fantasies. The Prince of Mist was his first book, and it did not disappoint.The war in Europe plays only a background role in the book, much as it does in The Lion, The Witch and the Wardrobe. The Carver family decides to leave their urban home in Spain to escape the war. They move to a small beach town which has more than its share of secrets. Young Max discovers that their new family house was owned by a doctor and his wife, whose son drowned many years before. There is a strange walled garden behind the house, filled with creepy statues of circus performers. There is a shipwreck just off the coast, and a strange old man who runs the town lighthouse. The town clock runs backwards. Strange voices whisper in the house. Max and his sister Alicia soon meet a new friend named Roland, whose parents died in a tragic accident when he was small. Together, the three of them begin to unravel the mystery surrounding the town, which is entwined with an evil force from the past -- an entity known as the Prince of Mist.If you like quick, creepy reads with mystery and menace, The Prince of Mist is for you. It will keep you turning the pages, and probably leaving your lights on, late into the night. 3.5Buen libro. Tiene sus errores, el inicio es bastante lento, el final se me hizo largo, pero tiene ese toque Zafón que tanto me encanta. Who would have thought that Zafon, best known for The Shadow of the Wind and The Angel’s Game, started his writing life as a young adult author? Now that he has achieved fame his publisher is bring these back in English translation, some of which won YA awards in Spain. I picked it up without knowing it was a YA book.The story is a spooky mystery based around the main character, a pre-teen boy, his older sister and the boy’s older friend. It is set in a coastal village in Spain just before WW II. So within the first few pages we have a railway station clock running backwards. And I thought – “I get it – Harry Potter!” And it was very Harry Potterish. With the war pending, the boy’s father decides to move the family out of the big city to a coastal village. At first the family is unaware that the last boy who lived in that house drowned. We have a sunken ship in shallow water that the kids dive to and pick up treasures; a cemetery of circus freak statues that move and change position; an evil cat that sends a little girl into a coma; an ancient mariner who built his own lighthouse; an old film projector in the basement and old films that start showing current events. Of course the boy’s sister and the older friend fall in love.You don’t read a YA book for its literary value, so you get some clichés and lame analogies, like this on page 2 when the boy learns they are going to move: “To him, the news felt like a mad steam train hurtling through a china shop. His mind went blank, his mouth sagged, and his eyes glazed over.” I’m not a YA reader but I thought it was a good story and it kept my interest. This novel was originally written for people at all ages, but it was published as a YA novel. It is the first book ever written by Carlos Ruiz Zafon, and it is a ghost story! All of the above-mentioned reason made me curious to read it and see if it would scare me as much as I was hoping for. Having now read it, I have to admit that while it was a good enough story, it was also quite predictable, and it didn't scare me at all. I'm not even sure that it would've scared me when I was younger, just because it contains so many of the scary elements that you are used to in horror fiction. In my opinion, you can sense that this is Zafon's first written novel. The story isn't that strong, and the characters are rather flat. Still, it did entertain me, and it is after all a very short read, so definitely pick it up if you are a fan of Zafon or if you just happen to be interested in this ghost story. This was my first Ruiz book and it was fantastic! I recommend the audio book, it was very well done and even features music from Ruìz's own compositions. It almost had an Alfred Hitchcock feel to it. Just really good! Wow, I am NEVER. EVER. going to watch Paranormal Activity.Several scenes early in this book were SO SCARY that I had to put the book down to read something lighter to de-creep myself before I could fall asleep*. So, at least until I start living with other people again, I'm not allowed to read/watch anything scarier than this. :) So yeah, it's creepy. As soon as the creepiness is explained, I was fine, so it really was just a few early scenes, but I'm an anticipation person and the unknown creeps me out.Anyway, it's a translated book, and that occasionally shows with awkward turns of phrase. But there are also some really lovely phrases that impressed me so much that I had to grab a pen. Really beautiful writing at times. I liked that this combined a nonspecific location with historical fiction and the paranormal element. There's a lot going here.And I'll put it on my maybe booktalk list for next time I hit the middle schools. *One of those nights, I put down this book to look up and see a giant spider (I would include a picture, but researching exactly which type is creeping me out too much) on my ceiling. My life is so hard. 3.5 stars.“In an infinite universe, there were too many things that escaped human understanding.”Initial Final Page Thoughts.Um… so no one thought to ring the police or tell any grown-ups what just happened? We’re just going to look back on it as if it was just a crazy summer mad-cap adventure? Um…High Points.Max. I’ve been acquainted with a lot of Maxs recently and I have to say… it’s a good name. Beach houses. Roland. Alicia. Cats in wardrobes. Genuinely creepy. Beautiful writing, seriously this book was cinematic. “Sunbeams filtered through the water in veils of nebulous light that swayed gently with the motion of the waves and the surface was transformed into an opaque dancing mirror.”See? !I took down so many quotes from this book, it was gorgeous. The sea. Statues. Family mysteries. Old film projections. Creepy history. The prince of mist. Low Points.I won’t go on about this too much because there are spoilers poised ready to explode like a particularly vicious game of Minesweeper. But… well, when you finish a book with about fifteen questions (no joke, I have them written down in front of me) that you want to ask so you understand it… well, it’s not good.There was so much that didn’t get explained and the story was so great and so different and mysterious and intriguing and everything. This book needed a good 150 pages more to really get into the story and do Mr Zafon’s ideas justice.Because, I’m sorry to say, there were so many gaps in the plot.Also… I’m 87% sure there would have been a massive investigation into what happened in the last 30 or so pages. I mean… it’s kind of a big deal.And it wasn’t as if it was subtle. Hero.OK Max, you had the right idea in this book. You were extremely aware that you weren’t getting the whole story and you stood up for yourself when you thought you were getting short changed.We had that in common… I mean, we’ve finished the book now and I still have questions.Lots of them.But ignoring that, I really liked you. I liked that you loved films and that you were a great little brother and that you were a bit disgruntled with being third wheel. I also liked that you didn’t freak out and go catatonic when all the mental stuff happened in the end. Because that’s what I would have done and the book would have been extremely boring if I had been the heroine.I also liked that you got out of breath when you rode your bike up the hill. Because that is me.So if we were to be friends, and I hope we will be, we could just maybe go for a leisurely walk. Maybe even up a slight incline if we’re feeling a bit adventurous. Theme Tune.Death of a Clown by The Kinks.Not really anything to do with this book but, well, I really hate clowns.Also, I had no idea what other song I could use for this book. Also (x2) I love The Kinks.Scaredy Cat Level.Off the chart.I know a lot of people will be like ‘Um, Jo, it’s 200 pages long and it’s about circus performers and sunken ships and beaches… how can you be creeped out by this book?”Well, my friends, I’ll tell you.Gather round, grab a brew, pull up a pew and I’ll tell you a story about Jack A Nory. Um, actually… I won’t.I don’t mean to mislead you… this story will be why this book really freaked me out.STORY TIME (which, when I’ve reached my eventual point, may contain a smidgeon of a spoiler) For as long as I can remember I’ve had an irrational fear of ships… big ships. Especially when they’re out of water (You should see me when I watch the Titanic…:-|). Coming from a city and avoiding the Manchester Ship Canal like the plague, my fear was manageable. I could quite happily avoid seeing them. That was until I went to university. You may or may not know that I went studied in Bangor, North Wales. It’s a lovely university in a ‘city’ (because it has a cathedral and a university… that’s it) that is famous for having the second longest pier in Wales and producing Aled Jones. Yes… that Aled Jones. The university is known for famous alumni such as Helen Fielding (also, apparently, Bridget Jones herself) and Danny Boyle (We had the same lecturer… so technically I’m going to win an Oscar… right? ).And it can boast some fantastic honorary fellows such as Richard Attenborough, Rhys Ifans, Archbishop Desmond Tutu, Philip Pullman (been in the same room as him twice and yes, fangirled myself out) and… and Carol Vorderman. It is also known for fantastic degrees in psychology and marine biology due to its location and the close proximity it has to the Menai Straits. (I did English with Film Studies because I like to be different, obviously… also science and I fell out when I was 17. ).But anyway, getting to the point, at least 75% of my closest friends take/took marine biology and a lot of their course is practical.So they like to dive, in lovely exotic places like Egypt and just off Puffin Island.And they like to take pictures.Of huge ships… underwater.And my Facebook feed is inundated with them when they come back from a dive.And it’s pretty much my worst nightmare. Also, on the train journey from Chester to Bangor (I’d say around Flint or Rhyl, if you know the area) there is this mahuuuusive beached ship that you can see from the train. I always ask my friend to tell me when I can look out of the window again but, because she’s sadistic and cruel, she always says ‘Oh… you can look out now’ and I do and BOOM. There’s a ghost ship in my eye line.I’m not a fan of big ships.Or clowns. But surely I don’t need to explain that do I? I mean… you have eyes right?So when they’re all swimming around in the hull of a possessed sunken ship with a clown who can seemingly hold his breath longer than Mr Threepwood… yeah. I wasn’t pleased, I’ll tell you. Normal people Most people will think that isn’t scary at all… but I’m not normal most people. Recommended For.People who love beautiful, atmospheric writing. People who don’t mind a lot ofsome unanswered questions. People who don’t look at statutes and immediately think “Oh my god, is that going to come alive when I turn my back?”. People who aren’t afraid of boats/clowns/clocks. People who aren’t scared of that Dr Who episode (Blink,is it?) that I haven’t seen but my friend told me about... urgh. People who are quite happy to paddle in the sea as opposed to diving amongst ship wrecks on their jollies. This book was sent to me as part of a book tour with the brilliant and lovely UK Book Tours. You can read this review and lots of other exciting things on my blog here. I stumbled upon this book at my daughter’s school library thinking that it might be fun to read a magical, adventure story. Yes there was magic and adventure, but it also had one of the scariest and horrific sounding ghost that truly frighten me. I felt sensations that I hadn’t felt in years. Reading this sent shivers up my spine, put goose pimples on my arms, and it had me screeching like a little girl.The book starts at a nice steady pace when Max Carver’s father decides to move his wife and three children from the city to an abandoned seaside beach house to protect his family from the ongoing war. But as Max and his family arrive at their new town and home, he notices some peculiar things are starting to happen. Clocks that seem to move backward, that feeling of someone breathing on your face, voices only children can hear, and circus statues that change shape and positions. The house itself has a devastating history, and Max being a curious young boy starts snooping around. It almost felt like he had woken or disturbed something. As time goes by the pace does build as the Carver children and their new friend Roland struggle to defend themselves against payback from this dark sinister entity.Like Mr Zafon’s previous books (Shadow of the Wind, and Angels Game) he has a knack of creating this eerie, gothic atmosphere, but at the same time is beautiful. At the beginning of the book Mr Zafon said it was aimed at young reader, but would also appeal to all ages. Well I think he has achieved it. I personally thought it was wonderful, and I would recommend it to ages from 12 years old onwards. Nice little story, although I wonder if it has enough excitement to satisfy young'uns raised on the Harry Potter series. This was Ruiz-Zafon's first novel, originally published in 1992, so don't expect the depth and genius of The Shadow of the Wind. Still, there are a lot of elements I think will appeal to kids: the weird cat, the sunken ship, the old film reels, the clown (somewhat reminiscent of Stephen King's Pennywise). The first half of the book is fairly ordinary. I kept wondering when it would get scary. The second half is much more exciting and supernatural. All in all, I liked the story, but felt there were some aspects of the plot and characters that were underdeveloped or insufficiently explained. Great stuff for a first effort though. Fans of his more recent adult novels will recognize the author's gift for using weather and architecture to set the scene and build suspense. The latest of Carlos Ruiz Zafón's works to be translated into English is also the first book the author had published. It was originally intended for teenagers, but this edition is clearly being marketed towards the author's adult fans; it has the same cover design as his adult titles, and a preface explains that it is designed to be enjoyed by readers of any age. I didn't go into this with high expectations, and I expected it to be kind of immature, but I still found it very disappointing.The story begins promisingly. A young boy, Max, moves with his family from the city to a seaside town. He quickly learns that the previous owners of his new home were dogged by tragedy, and on top of that, he finds a sinister walled garden full of statues in its grounds. He's particularly spooked by a clown statue, and during his exploration of the garden, he notices that this figure appears to have moved slightly since his arrival, changing its pose to a beckoning gesture. (Great detail - would have scared me as a child.) He then befriends a local boy called Roland, who takes him diving around the wreck of a sunken ship; and from Roland's grandfather, the only survivor of the shipwreck, Max learns the story of the nefarious Cain, the Prince of Mist. The stage is set for a chilling tale about a ghost ship, a powerful villain, mysterious disappearances and so on - technically, this should make a fantastic spooky story.However, the book soon begins to get quite silly and more and more plot holes and unanswered questions pop up, until it all becomes totally unbelievable and rather boring. For instance... Who or what is Cain and how has he attained his power? How do he and his troupe turn themselves into statues and why is this the only way for them to survive the sinking of their ship? Is Cain's cat meant to be a manifestation of him, and if so, how can he also be the statue, and if not, how did it alone survive the disaster intact? (The whole 'evil cat' thing is such a boring cliché anyway, and really put me off from the start.) If 'Jacob' was old enough to be filming with a video camera alone prior to his change of identity, how on earth can he not remember anything before his parents' death? I KNOW you can't expect a young adult book to explain everything exhaustively, but when I think of the detail and care so obviously put into the better examples of children's literature I can call to mind, that isn't really an excuse for the plot to be SO underdeveloped.The other thing that really grated was the indeterminate sense of time and place, which was confusing as I couldn't see any reason why the story shouldn't be definitively set in a real country, at least. I don't know if details have been changed here to make the story more easy to relate to for English-language readers; if so, this was a mistake. Finally, there's also the fact that the adult characters are constantly referred to by their full names - don't ask me why, but this is one of my biggest pet hates when reading. I'm still interested in the author's work and will probably read any further adult novels translated into English, mainly on the strength of The Angel's Game. But I will be giving his YA fiction - a category I believe the forthcoming Midnight Palace falls into - a miss. Un libro estupendo; me ha mantenido muy al pendiente y ha sido un gusto leer una novela que fue la primera de un autor que me gusta tanto. First of all, this book is labeled YA but it reads like a middle grade book. Other than one scene in which the main character spies on his sister and sees her making out with a boy, the whole book is written for a younger audience than YA. And btw, I'd probably call it 2.5 stars.And yes, as some of the negative reviews say, this book is full of plot holes. Big ones. Things that should have been explained, but never are--like how the statue garden came into existence. It drove me NUTS that I never found out.That said, the concept is actually pretty cool. And I did like/connect with the main character. The others not so much, but yes, the main character, which is important.FYI--the way I rate books, 3 stars means the book was "okay" and that I did finish it, but it wasn't a story that really impressed me. So, you notice I dropped the rating for this one a little lower, even though I did make it to the end. My big gripe was that the plot had SO much potential--opportunity for the main character to really sleuth things out--but basically it was him going from person to person and being told stories, but incomplete ones and he would get frustrated then go back and ask the person for more information. The only thing he actually did discover truly on his own was something I had figured out very early on (and, btw, created another big plot hole).Anyway, the reason I bumped this to 2.5 stars is that it actually would probably be a good book for a middle schooler who likes kinda spooky stories but is struggling with reading comprehension. Because this book lays out the information in a very "telling" instead of "showing" way, it might help kids who would otherwise get lost in an intricate plot. “O Príncipe da Neblina roubara-lhe o melhor amigo de infância, a única mulher que amara e, por fim, furtava-lhe cada minuto da longa maturidade, transformando-o na sua sombra.”Mais uma vez, Zafón brinda os seus leitores com uma história misteriosa, cheia de cinzentismo, e com algum terror à mistura.Tudo começa quando a família do jovem Max se muda para uma pequena cidade à beira-mar, na tentativa de uma fuga de uma chamada para a Guerra que se avizinha. No entanto, outras guerras escondidas virão e poderão ser ainda mais perigosas para esta família...Esta mudança drástica não é do agrado de Max, mas quando descobre um jardim de estátuas atrás da sua casa nova, sente que um grande mistério está por detrás delas. E começa a sua investigação. Tudo se adensa quando se descobre o que está por detrás de toda a história dos antigos proprietários da casa: o filho do anterior casal morreu afogado e nada voltou a ser como antes.Procurando integrar-se com a população local Max e a sua irmã mais velha vão conhecer o jovem Roland que aumenta ainda mais o mistério do livro, porque é através desta personagem que vai surgir o Príncipe da Neblina.Apesar de ser um livro virado para a camada mais jovem, gostei da narrativa simples, fluída e interessante que transporta os leitores menos jovens para essa altura das aventuras, dos primeiros amores, dos sonhos dos navios abandonados e dos tesouros escondidos.Gostei. É mais um 4,5 do que um 5.. mas é impressionante como este autor mexe comigo. sempre que leio Carlos Ruiz Zafon lembro-me como é importante ler bons autores! So good.I really liked this book-it was mysterious,interesting,with great twists.I loved the characters,the story,and that ending...oh,man.But seriously,I really enjoyed reading this,mainly because the story was very captivating,I just had to find out what will happen next and what is the truth about Orpheus and the Prince of Mist.Also,this book doesn't contain a love triangle or an irritating main/supporting character.Overall,a really great book. Si no cuentan los días que estaba en exámenes, sería el libro que he leído más rápido en estos días. Sí, la universidad quita tiempo.Carlos Ruiz Zafón, aunque es su primera obra si no me equivoco, es capaz de crear un escenario tan creíble para el lector. Toda la vida admiraré su prosa. Además, en este libro, introduce algo de suspenso que, evidentemente, está muy bien planteado.Le iba a dar un puntaje de 3.5 porque sentí que los momentos del bote fueron más largos que los de suspenso. Sin embargo, el epílogo es hermoso. No sabía que esperar de este libro porque no sabía de lo que trataba ni había leído nunca nada de Ruiz Zafón. Ahora, después de acabarlo, puedo decir que me ha sorprendido mucho y para bien, y que pienso leer todos los libros de este autor.A pesar de que es un libro corto, presenta muy bien a los personajes, a los que acabas cogiendo cariño (o todo lo contrario).Está lleno de sorpresas y a pesar de no querer acabarlo no podía parar de leer. Estoy deseando poder empezar la segunda parte para ver si se resuelven los misterios que en éste han quedado sin resolver. Fantástica trama y fantástico modo de mantener la tensión. He disfrutado mucho su lectura y lo he devorado en poco tiempo porque realmente me ha enganchado. Muy recomendable para un público juvenil. Tiene bastante el espíritu de La sombra del viento. Las últimas páginas son para sufrir. En resumen, me encantó. If only I haven't read THE SHADOW OF THE WIND in the first place Yes people exactly this is the main issue with me whenever I pick up a Zafon novel. Most of the time this thing happens in the reverse. Like if you have read an author for the first time and you hated the book then I bet you will ever give the author any chance soon for your readership of his/her next book. But not here. I adoreTHE SHADOW OF THE WINDso much that I expect the same perfection from every book of Zafon which is wrong.I rate this book between 3 and 4. It has a good plot and the same gothic mysterious writing style I admire. It's basically a horror historical fiction for children but still I expected more from Zafon. The characters aren't well built, the mystery is not explained well and the end looked to me a bit rushy. Maybe because this was Zafon's first book because he got better in his later books.I was a little disappointed but still it was worth a read. I didn't pay much attention to genre tags or even the synopsis before I picked up this book, so the story came as quite a surprise to me!Well-written with an interesting storyline that keeps you wondering for a great deal of the book.Max didn't strike me as the typical 13-year old, in a positive way, and I enjoyed seeing him develop and grow up a little. His older sister Alicia is still pretty much a mystery and I would have enjoyed getting to know more about her background, but since the book is mostly from Max' point of view and he keeps thinking about Alicia being a mystery, it comes as no surprise in the end that not much is revealed about her.The Prince of Mist is a somewhat terrifying character and some of the story revolving around him is a little hard to believe, but I'm pretty sure that is intentional on the author's part.Definitely an enjoyable read. 4,5 —Este otoño cumpliré setenta y dos años y, aunque me queda el consuelo de que no los aparento,cada uno de ellos me pesa como una losa a la espalda.La edad te hace ver ciertas cosas. Por ejemplo, ahora sé que la vida de un hombre se divide básicamente en tres períodos. En el primero, uno ni siquiera piensa que envejecerá, ni que el tiempo pasa ni que, desde el primer día, cuando nacemos, caminamos hacia un único fin. Pasada la primera juventud, empieza el segundo período, en el que uno se da cuenta de la fragilidad de la propia vida y lo que en un principio es una simple inquietud va creciendo en el interior como un mar de dudas e incertidumbres que te acompañan durante el resto de tus días. Por último, al final de la vida, se abre el tercer período, el de la aceptación de la realidad y, consecuentemente, la resignación y la espera. A lo largo de mi existencia he conocido a muchas personas que se quedaron ancladas en alguno de esos estadios y nunca lograron superarlos. Es algo terrible. Carlos Ruiz Zafón - Carlos Ruiz Zafón is a Spanish novelist. Born in Barcelona in 1964, he has lived in Los Ángeles, United States, since 1994, and works as a scriptwriter aside from writing novels.His first novel, El príncipe de la niebla (The Prince of Mist, 1993), earned the Edebé literary prize for young adult fiction. He is also the author of three more young-adult novels, El palacio de la medianoche (1994), Las luces de septiembre (1995) and Marina (1999).In 2001 he published the novel La sombra del viento ("The Shadow of the Wind"), his first 'adult' novel, which has sold millions of copies worldwide. Since its publication, La sombra del viento has garnered critical acclaim around the world and has won numerous international awards. Ruiz Zafón's works have been published in more than 40 countries and have been translated into more than 30 languages.